Johnson’s a partner at Come Home Baltimore, a real estate development company working in East Baltimore’s Oliver neighborhood. He’s also executive director of the Come Home Baltimore Foundation, a nonprofit arm created to coordinate and liaise with resources in the community. “David” is David Borinsky, Come Home Baltimore’s CEO. The two met when Johnson and his wife purchased one of Borinksy’s custom-built homes in Oliver in 2010. Johnson’s involvement, at first as an informal adviser and eventually as a business partner, took Borinsky deeper into community relations. Cueing off of conversations at monthly meetings in Oliver and weekly informal happy hours organized by Johnson, the community’s own vision became a basis for reaching out to existing nonprofits or city agencies, enlisting them to provide services to neighborhood resident, as well as courting prospective homebuyers and other residents. It’s real estate development on the community’s terms. Because it’s been driven by the community, outreach to nonprofits and city agencies can seem a little ad hoc from the outside. There’s a group of local veterans known as The 6th Branch, who contribute a range of initiatives including an urban farm down the block from Come Home Baltimore’s office, which a few neighbors cited as their favorite part of Oliver. Johnson and Come Home Baltimore helped organize a weeklong blitz of door knocking and cleaning up vacant homes, in conjunction with the Baltimore Police Department and other city agencies. There’s a small informal, volunteer task force that is currently brainstorming ways to upgrade a liquor store on Franklin Street into something more family-friendly without necessarily displacing or running the current owner out of business. And now Borinsky and Johnson have been in talks to formalize a relationship with Strong City Baltimore (recently undergoing a name change from the Greater Homewood Community Corporation), a large local umbrella organization that coordinates the work of other area nonprofits. Deep in the heart of Baltimore, Oliver is walking distance to the Inner Harbor and to the chic Fels Point neighborhood on the waterfront. You can see the Inner Harbor Fourth of July fireworks from its stoops. Yet Oliver is somehow still marginal — not quite in the downtown area, and just outside the catchment area of the EBDI partnership anchored by Johns Hopkins University (whose own struggles Next City chronicled in “The Great East Baltimore Raze-and-Rebuild”). To sell Oliver’s vacant homes successfully, at market value, and create a racially and professionally diverse, economically integrated neighborhood, Johnson believes the community has to work closely with developers. 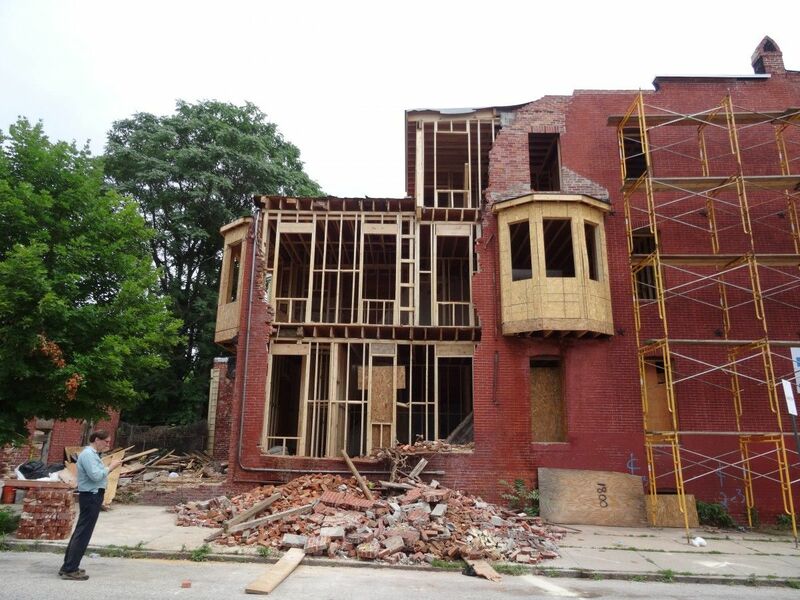 And developers aiming to build equitably in neglected or distressed urban neighborhoods need to work with the community and not consider that part of the work a side project. The economic benefits can work both ways, the partners think. The model shows promise: A 2013 Baltimore Sun article reports Oliver residents saying the neighborhood is finally turning around. And Come Home Baltimore has sold 32 homes since 2008, at prices now hovering between $200,000-$250,000, up from $140,000 on the first home Borinsky sold. So why don’t more developers work this way? Baltimore-based lawyer Eric Hontz provides investment research and due diligence to broker-dealers on a variety of complex alternative investment products. He and his wife, a city employee, fell in love with Baltimore while he was pursuing his JD/MBA from the University of Maryland, where he also worked at a community development clinic while in law school.